About "Surface area of pyramid worksheet"
Surface area of pyramid worksheet is much useful to the students who would like to practice problems on 3D shapes. 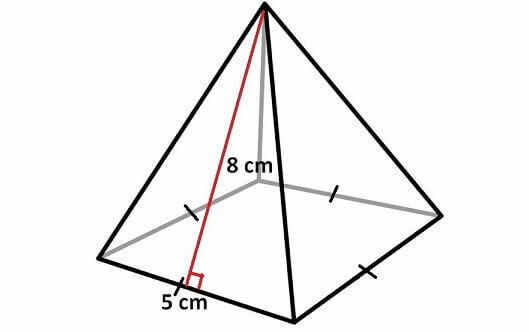 1) Find the surface area of the pyramid given below. 2) Find the surface area of the pyramid given below. 3) Find the surface area of the pyramid given below. Find the surface area of the pyramid given below. In the above pyramid, the base is a square with side length 5 cm and each wall is a triangle with base 5 cm and height 8 cm. Let us find the area of each face separately. 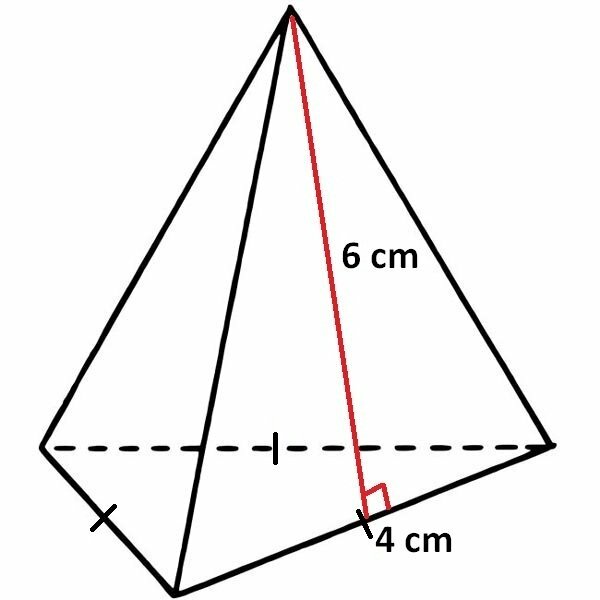 Let us look at the next problem on "surface area of pyramid"
In the above pyramid, the base is an equilateral triangle with side length 4 cm and each wall is a triangle with base 4 cm and height 6 cm. To understand and solve the problems given on "Surface area of pyramid worksheet", we have to know the stuff "Surface area of pyramid". Now, let us look at the stuff "Surface area of pyramid". Pyramid is basically a 3D shape. Even though we have different formulas to find surface area of different kinds of pyramids, the basic idea of finding surface area of a pyramid is to add the areas of all the faces. To understand how to find surface area of a pyramid, let us consider the pyramid with square base. Here is the basic idea to find surface area of the above pyramid. For any pyramid, if the shape of the base is square, then we will have four side walls. The shape of each side wall will be a triangle with equal area. 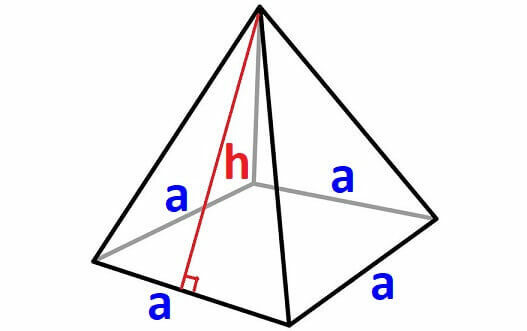 In the above pyramid, the base is a square with side length "a" and each wall is a triangle with base "a" and height "h"
This is the formula to find surface area of a pyramid with square base. 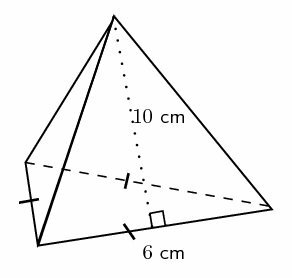 We can apply the above explained basic idea to find surface area of a pyramid with triangular base. Let us find surface area of a pyramid with triangular base. For any pyramid, if the shape of the base is equilateral triangle, then we will have three side walls. The shape of each side wall will be a triangle with equal area. 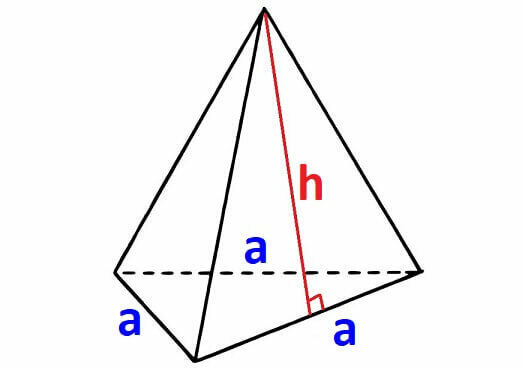 In the above pyramid, the base is an equilateral triangle with side length "a". And each wall is a triangle with base "a" and height "h"
This is the formula to find surface area of a pyramid with equilateral triangle base. Note : If the base is not equilateral triangle and it is either scalene triangle or isosceles triangle, then the area of side walls will not be equal. We have to find area of each side wall separately. After having gone through the stuff given above, we hope that the students would have understood "Surface area of pyramid worksheet". Apart from the stuff, "Surface area of pyramid worksheet", if you need any other stuff in math, please use our google custom search here.